Aston Shuffle DJs, Twinsy, Purple Sneaker DJs, Tyler Touche and triple J fave Lewi McKirdy have just been announced as the second round of bangin’ artists for the fifth, eagerly anticipated, Soundscape Festival. Joining The Temper Trap, Missy Higgins, Bluejuice, Yacht Club DJ's, Big Scary, Strange Talk, Scryptcha, Mitzi, The Cairos, The Mornings and Asta, this latest batch of acts will be entertaining music fans on Hobart’s waterfront mainstage, with several of the freshly announced artists also heading in for exclusive, just announced, sets in the Silent Disco, alongside some of Tassie’s hottest up and comers. 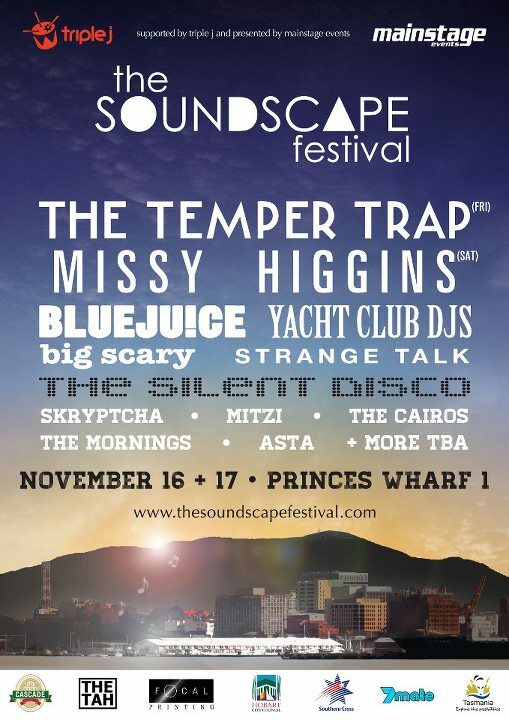 Also appearing at Soundscape 2012 will be locals: DJ Grotesque, Akouo, Adam Turner, Simon Lovell, Lids, DVEY, Charly Venn, Kenny Beeper, Wax Docta West, Clara Fantini and local crews from Frequency, Recreational Thugs and Paperthin going head to head in a party-off. Door sales incur a $20 fee. However, due to the limited capacity of the new location, door sales are very unlikely to be an option.